In a previous post, I outlined the donations received by registered political parties in New Brunswick for the years 2009 – 2012. Now that the 2013 data are available from Elections NB, I have included the recent numbers in a re-analysis for the years 2009 – 2013. This time around, I have prepared a separate chart for each party and you can get an estimate of the ebbs and flows of funding from each source. YELLOW: UNION – Union donors. The vertical axis shows the donation amount from each source (as well as the total). Axis values must be multiplied by 1000 to give the actual amount. Note that the scale of the vertical axis is different for each party. The funding pattern shows an upswing in donations during the year prior to the election and in the election year itself. Following the election, there seems to be a drop-off in donations until the next election campaign starts to roll in earnest. During the last election year (2010), the Progressive Conservatives raised just over $2 million. You can see that about half of that came from corporate donors (the actual donors are listed in the Annual Financial Return which you can obtain from Elections NB). 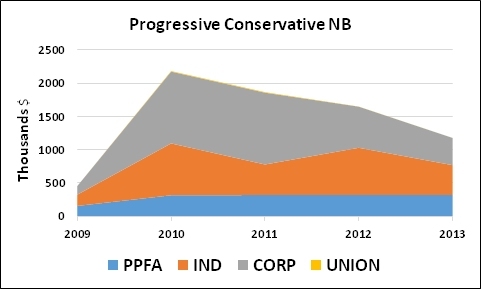 Throughout the 2009-2013 period, the Progressive Conservatives were less reliant on PPFA funding than the rival Liberals, or any other party. The lack of an uptick in funding in 2013 must be of some concern.